I feel like I'm always trying to find the perfect red lip - the one that looks bold and crisp, stays put when I eat pizza (I feel like pizza is important enough to include in my list of demands) and doesn't strangle or dry out my lips. In my never-ending lipstick hunt I've found a few duds and a few solid players that I return to again and again, but I still haven't found the one. It applies very evenly and is super opaque. I applied 2 layers to get a denser color and had no issues (some other liquid lipsticks freak out when you layer them). Keep lips apart while its setting - a minute or two - because it can be a little sticky. Also, make sure to apply to each lip separately instead of rubbing lips together like some people do with tube lipstick, and use the tip of the applicator to get a crisp outline. In this close up, you can see that the color in the tube appears to have tiny glittery specs, but on my lips the color appears more matte. At certain angles, some shimmer can be detected, but at others it is definitely matte - I'm considering this the perfect in-between finish. The formula is fully set and feels pretty comfortable on my lips. It feels somewhat heavy, but not to the point of discomfort, and is still flexible enough to allow my lips to stretch and move without cracking or flaking. It does not feel dry or like it's strangling my lips, which is a claustrophobic feeling I've gotten from other liquid lipsticks. So far, so good! Still going strong two hours in. The first real challenge! I ate lunch (and drank a glass bottled Coke!) in the 1:00 hour, and noticed some definite signs of wearing around the edges of my lips. I could see by the bites of my sandwich that it was coming off on my food a bit. I don't like to think about how much lipstick I've eaten in my life. The wear was noticeable, but even (no ring around the lips situation). I guess this can't stand up to the almighty sandwich. Bummer. Still, for a full meal the wear is not awful and was definitely less noticeable from a normal distance than it is in this super closeup. It didn't continue to wear down after eating - just maintained the same wear. I'd planned to not touch up the color in any way during this test, but around this point I realized I didn't want to walk around with messed up red lips if I could help it. I touched up the edges and a bit in the middle of my lips, and I found that the color was able to cover smoothly and meld with the first layer(s) for a refreshed red lip. I was super impressed! With some other liquid lipsticks, when you try to apply more on top of the old layer it will get lumpy and just look terrible. This stuff looked fresh all over again. I took a gamble and it paid off! Success! The reapplication was very impressive. Still going strong now that we're back on track. My lighting was getting worse, but my lipstick was still doing well. Getting sick of taking so many pictures of myself, but not getting sick of these ruby red lips! Wahhhhh! I made the mistake of eating again (stupid human tendency) and it was even worse this time. I tried to eat carefully, but we had Chinese takeout and it was too intense of a meal for this lipstick. Despite the horror show seen above, the color is still okay from a normal distance. I wouldn't wear it like this if I was out, but it isn't as bad as it looks up close. Same deal. Messy, but whatever. And now you know the truth about how many times per day I change my hairdo. Up, down, up, down, repeat. Despite what I'd heard, this stuff can't really stand up to eating. Many lip colors can't, so this isn't a deal breaker for me necessarily. It probably isn't the one (if that even exists) but I'm happy to have it in my red lip arsenal. It also never felt dry or like I needed to top it with a balm, which is a HUGE win to me. Being able to reapply without gumming up the works is also fantastic. This lipstick is AMAZING for a day or night out that doesn't include eating, like going for drinks or bowling or to a party. I've done all of those with 100% success. I know it can't stand up to food so I avoid wearing it when I'm eating or just know that I'll have to reapply. There's still huge value in this product to me. 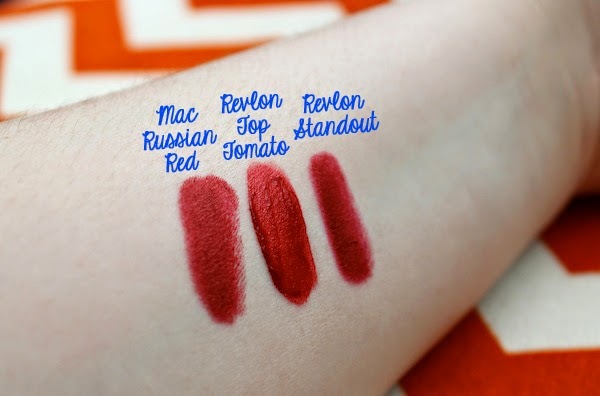 The shade is similar to some other popular blue-based reds, so I swatched it here next to those (MAC Russian Red and Revlon Balm Stain in Standout) so you can see a true representation of the color. Have you tried this stuff? Are you into liquid lipsticks in general? What is your ultimate red lip product? Please tell me! I doubt any lipstick could hold up through Chinese food. Or pizza. Or most sandwiches. Oil = lipstick killer. But it seems to have performed amazingly well otherwise! I need help finding a red lip color. I usually try to find one compatible with my skin color but my teeth always look yellowish and I'm not about to use White Strips since they make my teeth too sensitive. Any tips? This was such a helpful review! Thank you for keeping such back-to-back check-ins!! I love how you worded everything, too. Humor and makeup, can't beat it! I LOVE my Revlon Standout and was glad you compared Top Tomato with it. I'm interested, because sometimes it's a liquid lip color kind of day. I'd agree this lip product is great if you don't eat. But I feel like I'm always super aware of how my lipstick is looking after drinks or food so it wouldn't be any different to reapply this after a certain time. Thanks again for the awesome info in the post! Hey lady, I just nominated you for a Liebster Award, which brings attention to blogs. I have some questions posted for you if you are interested.